The Reporting tool provides a very simple way for users to report issues (e.g. Fly-tipping, potholes, hazards). Although the tool is very simple to use, it supports a number of advanced features for submitting reports to your back-office system of choice. When the user activates the Reporting tool an orange marker will be shown at the map centre. This is the location that will be reported. 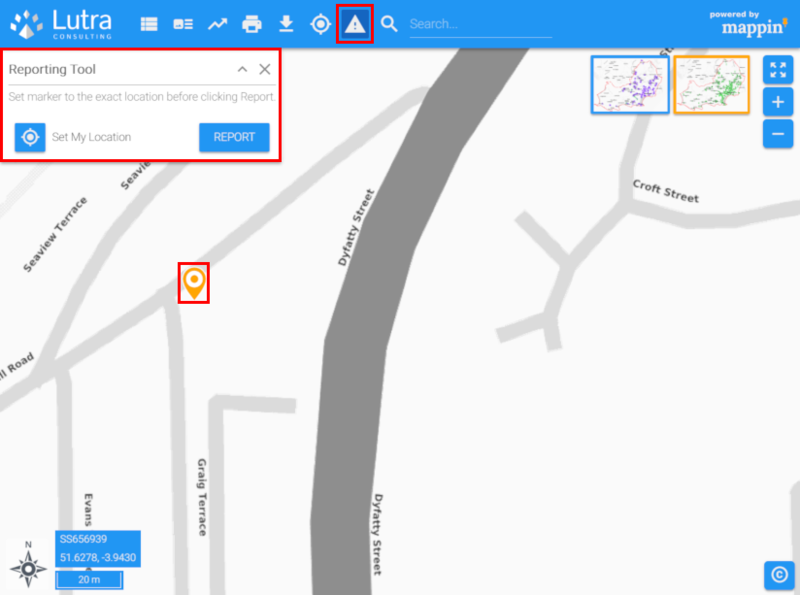 The user may now position the marker exactly by either (1) clicking on the map or (2) dragging the marker or (3) using the Set My Location option which will position the marker at the location reported by their browser or mobile device. The user submits the report with REPORT and should receive notification of successful submission as shown below. With Mappin’s support for multiple projects, the Reporting tool can be configured in different projects to report incident types (e.g. Fly-tipping, potholes). The Reporting tool has the following settings. When the user clicks REPORT, the reporting tool optionally performs some pre-submission checks before sending the information configured in its settings to a third-party HTTP endpoint / URL (e.g. your back-office system) using the HTTP POST method. An alias for the Reporting tool (e.g. Report Fly-tipping). An optional layer used for pre-submission checks. 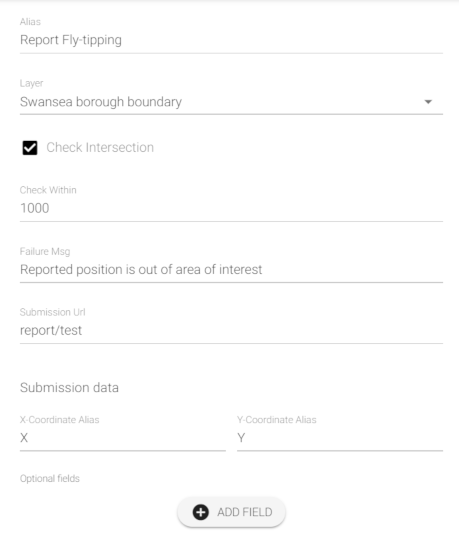 If enabled, will check that the reported location intersects a feature from the pre-submission checks layer. If enabled and the check fails, Failure Msg (see below) will be displayed to the user and the report will not be submitted. If specified, will check that the reported location is within Check Within map units of a feature from the pre-submission checks layer. If specified and the check fails, Failure Msg (see below) will be displayed to the user and the report will not be submitted. A failure message shown to the user if any of the pre-submission checks fail. The Url to which the report will be submitted to by Mappin using the HTTP POST method (e.g. http://your-back-office-system.example.com). As a minimum, the x and y coordinate values are submitted within the report. The alias settings can be used to control the HTTP POST variable names used. The ADD FIELD button can be used to add optional fields. A Literal field adds a POST variable with a static value that never changes. If you have configured multiple Mappin projects for reporting different types of incident and you send all reports to the same endpoint, then this can be a useful setting to specify what type of report is being submitted. Here we define a POST variable called report_type which has the value flytipping. An Attribute field allows attribute values from nearby features to be included in the report. For example, when reporting dog fouling in parks, you wanted to include the name of the park in the report submission - you’d just specify Intersection with the Public parks or gardens:Name attribute. Condition can be Intersection or Nearest (returns the selected attribute value of the nearest feature). An Optional CRS field allows x and y coordinates to be submitted in other coordinate reference systems. In the example below we’ve added lon and lat fields which will return longitude and latitude in WGS 84 (EPSG:4326).